The revolutionary BodiTrak Golf system is now available in the UK. 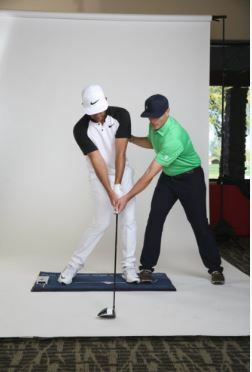 The BodiTrak Golf System is the first portable and affordable mat to record balance and weight distribution information and Centre of Pressure (“COP”) during the golf swing. Using patented smart fabric technology and proprietary software, BodiTrak is finally bringing real-time balance & vertical force data – the ‘next pillar of instruction’ in golf in an attainable way. 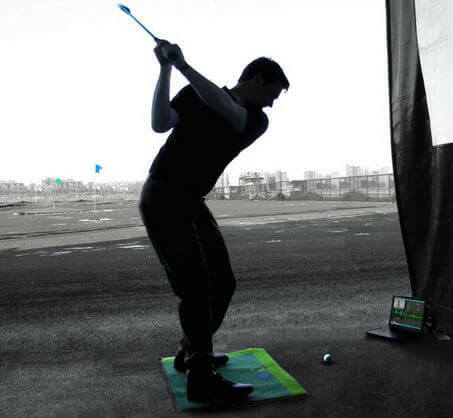 Call +44(0)208144 1550 or Email sales@golfswingsystems.co.uk to arrange a demonstration. The BodiTrak Golf System is the first portable and affordable mat to record balance and weight distribution information and Centre of Pressure (“COP”) during the golf swing. 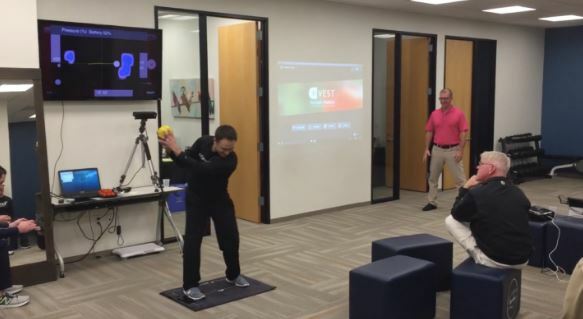 BodiTrak allows a coach to provide cutting-edge technology to students, giving immediate performance results, enhancing skill retention and bringing new revenue stream opportunities to a lesson business. These are exciting times for the BodiTrak community. We’re proud to announce that Blast Motion and BodiTrak Sports have partnered to develop the BodiTrak Dash mobile app, used in conjunction with Blast Connect, to deliver a fully integrated ground-force, pressure, and video analysis solution. 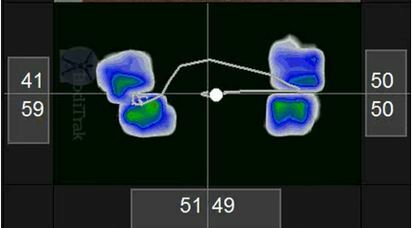 The app will be used with BodiTrak to capture and analyze an athlete’s ground force and pressure distribution in real-time. 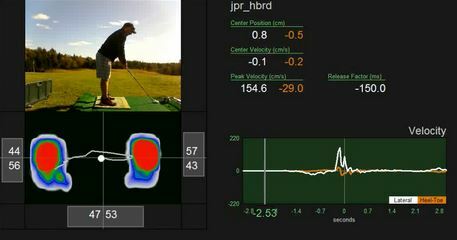 The app can automatically upload video and data to the BodiTrak dashboard, where it’s fully integrated with the Blast Connect software analysis, coaching, communication, and management tools. 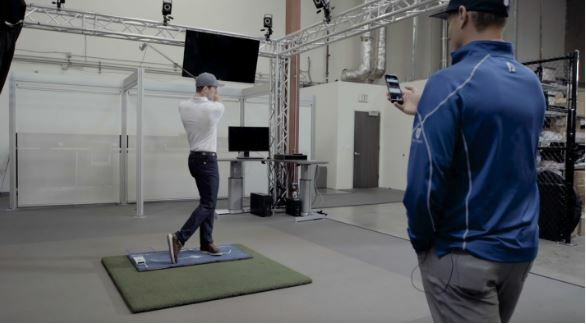 The Dash app captures high-speed, HD video alongside BodiTrak’s foot pressure distribution maps to maximize the analysis of an athlete’s ground force mechanics. 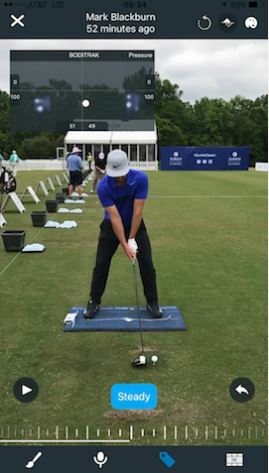 The app’s video scrubber allows the coach to quickly review video, while the app’s integrated drawing and voice recording tools allow the coach to overlay analysis information on the video for real-time feedback or upload to the BodiTrak dashboard on Blast Connect. When the Dash app is combined with a mat, the app captures, synchronizes, and displays ground force and pressure distribution data, providing comprehensive cause-and-effect motion analysis of ground mechanics. Ground mechanics, the analysis of force & pressure data in golf and sports performance, has quickly become a must-have training and performance assessment tool. Blast Connect is a suite of software services that were developed in conjunction with some of the top academies and coaches. The highly integrated communications framework streamlines coaching feedback and provides powerful video analysis, voiceover, and markup features to deliver advanced training insights, while providing athletes direct access to their performance metrics, videos, and training history. To further enhance the value of the 360-degree solution for coaches and academies, Blast Connect includes additional tools that help them automate and manage their business, including scheduling, drill assignment, customer billing, competition management, leaderboards, and much more. 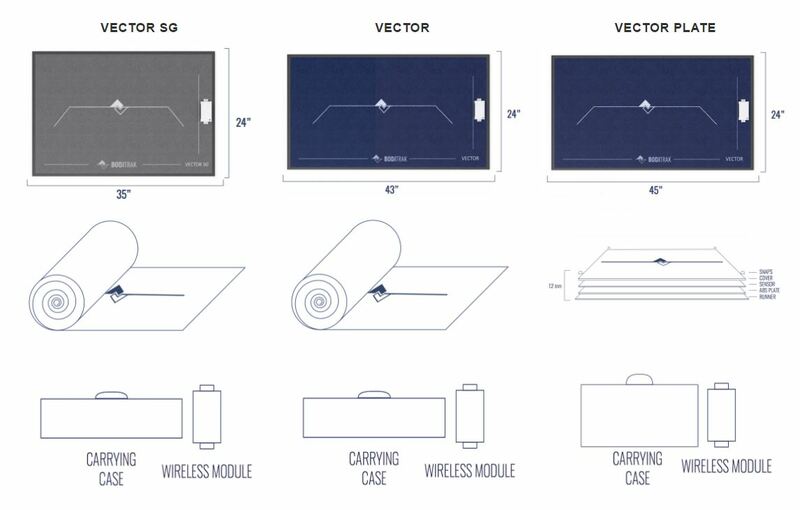 We’re excited to introduce this technology to the golf, wellness and fitness community. We’d like to extend a big thank you to our partner at Blast, our team of advisors and, most of all, our customers for helping to make this a reality. 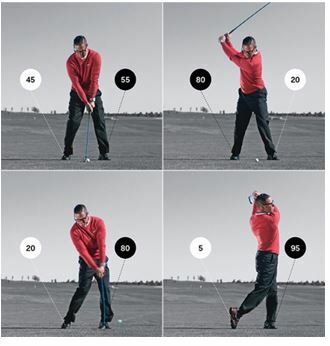 Captures a golfers balance pattern Indoors, Outdoors, Uphill, Downhill, On the putting green and In the sand trap. It’s flexible, roll up design makes it very easy to setup, use and move to the next hole or golf course. BodiTrak balance systems have been used for nearly a decade in rehabilitation medicine research. The Boditrak golf Mat is placed under an existing mat to validate the use with typical golf mats that exist at Golf Academies. In addition, this video details the portability of the Boditrak golf SHIFT System via use on any outdoor surface, any lie angle and as well information being shared on a portable tablet. 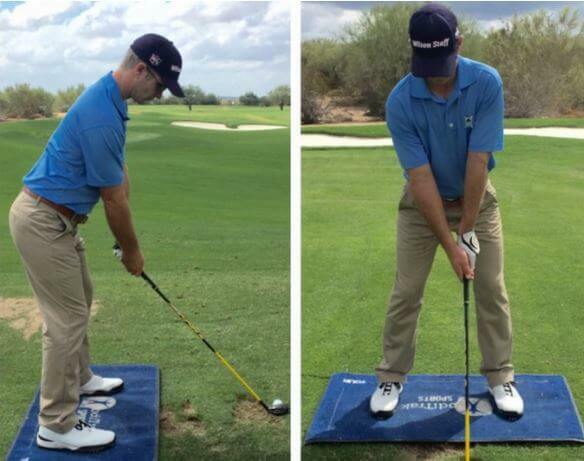 OUR PRODUCTS PROVIDE A NEW WINDOW INTO THE GOLF SWING — A PLAYER’S GROUND MECHANICS. OUR PRODUCT SUITE IS DESIGNED TO FIT ANY GOLF PERFORMANCE SET UP. TECHNOLOGY All BT products its our proprietary T7 sensors and firmware. ACCURACY BT sensors have been validated against research-grade force plates. MANUFACTURING All manufacturing and assembly occurs at our plant in Winnipeg, Canada. SHIPPING Current ship times are 3-4 weeks from order placement. WARRANTY All of our products come with a one-year manufacturer’s warranty. TECHNICAL SUPPORT We offer comprehensive set up and technical support to all of our customers. DASHBOARD combines the DASH iOS application (synced video & data) with a cloud-based analysis and athlete management platform, powered by Blast Connect. Coaches have full annotation, screen casting and communication tools with either DASH or DASHBOARD, and recordings are synced instantly with a student’s account. The BODITRAK DASHBOARD platform combines the DASH iOS application (synced video & data) with a cloud-based analysis and athlete management platform, powered by Blast Connect – a fully integrated force, pressure, and video analysis solution for sports, sports medicine and fitness. The iOS app captures and analyzes an athlete’s ground force and pressure distribution in real-time, syncing video and data to the DASHBOARD, where it’s fully integrated with the Blast Connect software analysis, coaching, communication, and athlete management tools. The BODITRAK DASH app is available for download here. Coaches have full annotation, screencasting and communication tools with either DASH or DASHBOARD, and recordings are synced instantly with an athlete’s account. Upload BodiTrak video/ data captures to Blast Connect or export to Camera Roll. The BODITRAK DASH App supports only iOS devices, running iOS 10. *Note we recommend using iOS devices with 120 or 240 FPS embedded cameras. The login to BODITRAK DASH is based on your Blast Connect user name and password. This video explains the steps to sign up and log in.